As long-time “tops” gurus predominantly known for selling replacement convertible tops, TopsOnline is proud to also offer vinyl landau tops to customers with hard tops covered in vinyl. If you are new to searching about landau tops, you’ll see a wide variety of language referencing this styling of vehicles in the marketplace. So, let’s talk about what vinyl tops are and what you need to know when shopping for them. First, a little technical history. Originally landau was a horse-drawn carriage term and referenced the collapsable roof that covered the carriage and side landau bars to make the adjustment up and down. As we transitioned from a horse-drawn world to that of automobiles, the term landau has had various associations with vehicles that have ranged from the earliest Model A’s which had a vinyl roof to 20’s and 30’s model hard tops that simulated convertibles. As car designs evolved, the use of a vinyl roof surged in the 50’s and 60’s, though they were not collapsible and didn’t have side landau bars. 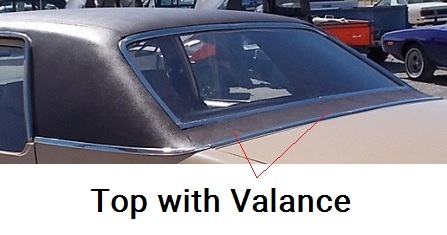 Auto manufacturers used the vinyl roof to give a higher-end luxury trim package on some of their vehicles, some even including landau bars to trim the side back quarter panels. This option trended through the 80’s and even 90’s, with Cadillac and Lincoln involving vinyl roof options in their signature styles. Since then, vinyl roofs are primarily relegated to limousines and hearses and are still seen in production of those vehicles today. The term landau can be used as a generic name for a hardtop vehicle with a cloth or vinyl covering on part or all of its roof and quarter panels. Some auto owners drop the term landau altogether and just say vinyl roof cover or vinyl hard roof. That may be because the word “landau” could be hard to pronounce. (As an aside, you can say landau as “land-oh” or “lan-dow” where the “dow” rhymes with “cow”.) You may occasionally hear someone use the word “faux” (meaning imitation) when talking about landau tops if they are trying to say that the design is a faux convertible top or faux cabriolet top. We will stick with both landau and vinyl top, since that is the main way that these types of roofs are referenced. As with all things, the vinyl used on a landau top will eventually wear and start to show its age. This can manifest in several ways, all of which you’ve probably seen at some point on some landau top that you’ve run across. As landau tops age, you can see worn areas weathered by years out in the elements. The vinyl may start to discolor and you may notice rust around the metal trimming. If you notice rust, that is a definite sign that you need to replace your vinyl top, so that you fix the spread of the moisture. Replacing your vinyl top is best done at an automotive upholstery shop (or even a body shop). On most vehicles with a landau top, the top vinyl layer can be replaced by removing the molding and clips that hold it in place. You’ll want to save the molding and clips, so you can reuse them on your new top. If you happen to break or loose one, you can easily purchase them to replace. Underneath the vinyl, many vehicles have a separate layer of closed-cell foam, called Insolite, that goes between the metal roof and the vinyl. If your Insolite is in poor condition (especially if it contains moisture) then most local auto upholstery shops can replace it when they are installing your new vinyl landau top. When shopping for a replacement vinyl top, the first thing to do is to take stock of what you currently have on your vehicle. Full Top - Does your vinyl top start at the front windshield and go all the way to the back trunk area? If so, this is a “full top” and sometimes called a cabriolet roof since it most mimics a convertible. ¾ Top - If your top starts in the mid-section of the driver’s side window, but before where the “half top” would start, then that is a “three quarter (¾) top”. Quarter Top - The final vinyl top configuration is when the vinyl starts at the top, often in line with the quarter panels at the back and extends to the trunk. This is called a “quarter top” or carriage roof. Two-Door or Four-Door - This one is easy to identify, but will impact the cut of the vinyl. Pillar Posts - Check to see whether your vehicle has a B pillar post (also called a middle pillar), which is the vertical bar that is sometimes between the front and back seat windows. Without a B pillar, these cars are commonly called hard-tops. With a B pillar, they are commonly called sedans. Choose a vinyl top that matches whether your vehicle has a B pillar post or not. Some models like the AMC Rebel and Cadillac Fleetwood have pillar sedans and pillarless hardtop models. Seams and Stitching - You’ll find that some models will have different options for seams. Some have side-stitching which has one seam on each side of the roof and others have center-stitching, which has a seam running down the middle of the roof. You can choose the seam that matches your vehicle. You’ll also see that some stitches are exposed and others are not exposed (they are stitched, folded over and then heated sealed), so that will vary as well. When you shop with TopsOnline, we always note which style options are factory original features, so you don’t have to worry about selecting something that is not original to the vehicle. 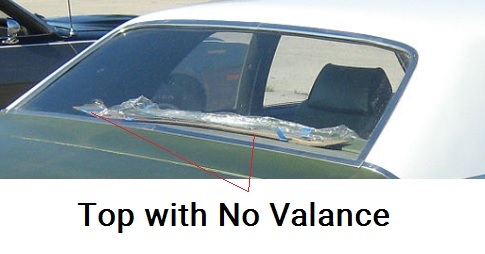 Valance - When you look at the back window of your vehicle does the rear window extend all the way to the trunk, or is there a strip of vinyl (also called a valance) between the window and the trunk? This is a distinction that some landau tops will have. Once you have made the distinctions above you’ll know exactly what type of replacement landau top you will need to purchase and the last portion is strictly the decision whether to keep the color original or pull out something more flashy. Since some models, like Cadillac and Lincoln, used landau tops heavily in their vehicle packages, you’ll find a lot of different combinations and models. Be sure to read the model specific content and look at any diagrams that are included for your model, since they will help you quickly see the differences for the options you have. If you’re worried about which top to select, feel free to reach out to our Customer Service team, and they will be happy to double check your selections with you. If you have a landau top on your vehicle, it deserves to look it’s best. 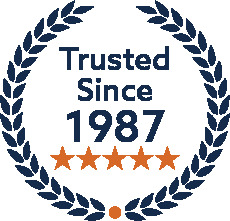 The TopsOnline team would love to see your top restored to its former glory and let your landau top keep a legacy going. Feel free to share your before and after photos so we can celebrate your new look with you.